Baby Adopter Sea is a new edition of Baby Adopter game where babies and their parents are traveling on a cruise ship. The voyage, ship's amenities and rooms add to the experience of taking care of your little baby. Baby Adopter Sea is a babysitting, nursery and dress up game for people who love to take care of little babies. The game pairs the game-play of the original Baby Adopter with unique navy and sea theme. Babies should grow within 20 days. You have to feed your baby when hungry. The baby has to be with energy equivalent of 30. And do not let your baby get sick... This is the goal of Baby Adopter Sea. 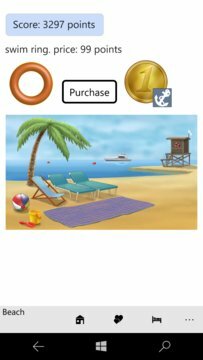 Another goal is to purchase all items for the Baby's room, Bathroom, Playroom, Game Center and the Beach and also purchase all the toys. The baby will respond with sounds on tap on Main screen. It is possible to change sound settings on Account screen. If you want to be notified promptly when your baby is hungry please pin the game to the start screen.